Regardless of your industry, the population of millennials — employees who reached working age after 2000 — is probably growing rapidly at your company. As the generation that grew up with technology, they know how to stay hyperconnected with people and information. This capacity, combined with young people’s natural energy and tendency to generate novel ideas, can accelerate innovation and productivity at any company if people and processes are properly managed. This ExecBlueprint describes effective approaches for recruiting and retaining this generation that has been alternatively described as entitled and creative. First, you may need to address conflicts with older workers if they resent millennials’ demands for flexible work arrangements, career advancement, and open relationships with leadership. Ask these groups to work together. Foster as much transparency as possible across the organization. Resist the temptation to apply the millennial label too indiscriminately to every employee in the age group. Instead, ask what each individual needs to succeed in your company. 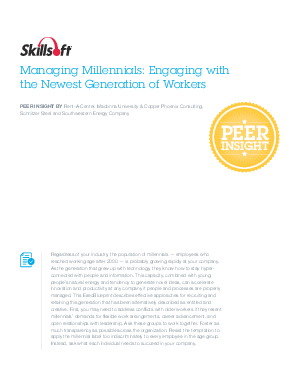 Download Managing Millennials: Engaging with the Newest Generation of Workers today.